This time last year I was involved in a planning day with a large number of schools and their staff, on the matter of 21st Century School Libraries Learning Learning. There is so much to think about in the design or re-design of such facilities no matter what the budget. Here is another presentation that piqued my interest, with relevance to school libraries. ‘Impressive new buildings are, on their own, NO GUARANTEE that improved learning will be achieved; although they may be useful in marketing terms, by helping brand an institution’. Take a look as there are some good points to take away for your own deliberations…..
A key feature of our library is its integration of 70s retro design – within a very modern 21st century look. I WILL post up a whole set of images and story of our renovation – when it’s done. “What?”, you say. “It’s still not fininshed?”. When you restrict work to holiday periods for a major overhaul – it’s gotta be a long-haul renovation. But we’re nearly there. 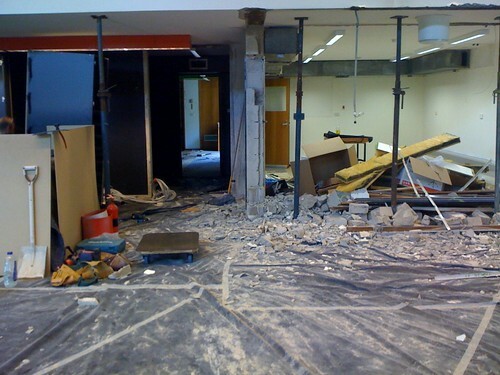 Here’s what it looks like at the moment…creating a new office, and new AV department! Phew! It’s a large area – smooth lime green cupboards, that hide filing drawers, slide-out storage baskets, books storage etc, and two whole purpose-designed laptop storage cupboards for laptops for loan. (Designed these ourselves!!) Each drawer has a ventilated base, a swing arm that delivers power and data within the drawer to fixed points – easy to connect laptops quickly. What I want to do with the smooth green doors is have different vinyl lettering/images that can transform the interface. So I was having fun looking at these 40+ Vintage Posters to inspire my developing design ideas. Next – we need Dean Groom to come on over and get cracking with more ideas. However, I know that the all the wonderful people that were there for the day were all putting an enormous amount of energy, care and thought into planning their renovations, extensions, or new school library buildings. Here’s the presentation slides – I know that some people are looking for some of the hyperlinks. Thanks to everyone in Cairns, and for making me feel so welcomed so far up north. During my holidays I have had plenty of opportunities to visit bookshops, and my favourite local library. Searching for a book I wanted to buy at a variety of bookstores, I was struck by the changes that have taken place in marketing, accessibility and presentation of at our best bookmongers. I must say that in a few of the stores I found myself foundering – where do I find the book? Is it there? Here I was, an information professional, confused and disoriented as I tried to make sense of the layout and organisation of the store!! Needless to say, I didn’t buy anything. Bad luck bookstore. But in two places (both highly successful and well patronised) I felt at home – and clearly so did everyone else – ages ranging from toddlers to grey-power! my favourite – a great coffee shop! I love the carpet that’s on the floor and the different places you can settle down and read a book. I love the use of object architecture to add interest. Oh, and I’m a regular visitor of the coffee shop in the last picture. So the two most successful places are Borders book store and my favourite Library, which does have its own fabulous coffee shop – including a super outdoor terrace with water features. This is interesting don’t you think? It slams home the changes needed in our school libraries quite nicely. But you know the great thing is that our public and school libraries can offer a lot more than even the best bookshop – loads of extra services, learning support, community support, meeting and study rooms, lots of computers, reference and information services. Better still, at my favourite library I can scan and issue the books out to myself – sometimes after I have picked out new releases to borrow that I have just read about in the Saturday paper! Good one! Saves me a bomb. How can a bookstore compete with this service, especially since some of the books I get are ones that I have reserved online at home. The astounding thing is that its all free! !